To describe this book as good value for money would be a considerable understatement. This is the literary equivalent of a compilation C.D. It provides the most recognisable track of 18 'artists' in one intense collection. The compilation's theme is the heady admixture of science and spirituality - a sort of open-minded cosmological enquiry which explores the vexed question: 'What is the Universe'? So, pursuing our musical analogy a little further, this is akin to jazz fusion, with a bit of indigenous music thrown in to spice it up,whilst Classical takes something of a backseat. Stephan Martin supplies the glue that holds this eclectic compendium together. His invited guests are a diverse bunch to say the least. Their common ground is an intense interest in the fabric of the universe, and what it all means. Some are scientists, others philosophers; some psychologists, others indigenous elders - most have realised that there is no straight answer to the questions posed, and that a multi-disciplinary, multi-faceted approach is required to gain any real insight into what the universe is all about. As captain of this disparate crew, Martin is a formidable helmsman. I was expecting a journalistic approach from the main author, just because of the format of the book. But he offers something quite different. Instead of pushing the boundaries of the conversations through challenge, he creates a more positive atmosphere. It becomes evident early on that he's done his homework. He's read the books written by his interviewee guests. Not only that - he understands the books. That's more impressive than it sounds here, believe me. Some of the material covered in this book is deeply profound. During the interviews he listens to what's said, and then offers thoughtful feedback, insights and clarification. This clearly delights his interviewee guests. They find themselves able to open up and explore deeper ideas, rather than falling back on safe, defensive positions. Through this technique, Martin facilitates adventurous discussions that explore a lot of territory. The risk with this is that sometimes the book comes across as some kind of metaphysical love-in. The interviewer and interviewee often agree with each other - 'Yes' is a word that crops up a lot. To my English ears, this heightened positive regard can be a little hard to handle sometimes; for example, the chapter with Barbara Marx Hubbard was excruciatingly gushing. Perhaps this reflects my natural British cynicism more than the book's content. The book is structured into three sections: Science, Spirit and Culture. Naturally, my interest was drawn to the first section most of all, although there were several excellent interviews in the Culture section too (including a wonderful discourse on light with Peter Russell). In the science part, I particularly enjoyed Bernard Haisch's discussion about the zero-point field and causation. The point was made elsewhere that scientists have yet to wake up to the repercussions of the quantum world: they have clearly embraced the theoretical models, but mentally still live in a Newtonian sphere which denies the kind of paranormal effects that the more bizarre edges of quantum science could easily lead us to. In this light, I particularly enjoy reading Edgar Mitchell, and his section of the book did not disappoint. To my mind, he has got as close as any thinker to tapping the true nature of the Cosmos. Off-the-cliff theorising was epitomised by James Gardner, who took his chapter into mind-boggling territory with his exposition about the formation of new seed universes on the other side of black holes. He argued that universes could be evolving organisms themselves; perpetuating through a self-replicating cycle, with a view to providing ever greater intelligence with each new birth of a universe. A remarkable idea! Another highlight for me included Duane Elgin describing how the Universe arises each moment, and how the microcosm reflects the macrocosm - humans reflecting back to the Universe a realisation of its self. This kind of thinking is almost Hermetic, or alchemical, and it is remarkable how the Western Mystery tradition seems to be enjoying a new life through many of the thinkers interviewed here. Buddhism also features strongly. There is such a broad sweep of influences within the book - some of them mutually exclusive! But that conflict creates a meaningful measure of our lack of understanding of the Cosmos. The Universe seems capable of accommodating any number of cosmologies, many of which have much to recommend them. 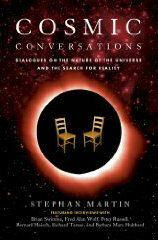 'Cosmic Conversations' contains a lot of studious philosophy, which makes it heavy reading but very rewarding. It defines a mystery without advocating a particular solution. Indeed, it shows that the Universe defies explanation, and is capable of simultaneously being all things to all people. Subtitled "Dialogues on the Nature of the Universe and the Search for Reality"